This is the Automatic Shirt Ironing machine which is In a cursory glance it first looks like a dummy which is laid in costumes stores / shops in order to attract the buyers / customers. The best benefit of Automatic ironing machine is that in presence of it you don’t need to fawning someone’s to iron your dresses. At present this shirt ironing machine is only available in Germany and according to their market its price is only 1029 Euros, so if you are from US, Pakistan or any other country it will cost you almost $1400 and 1.3 Million Rupees, respectively. In its features, it took almost average of 8 minutes to press per shirt and according to the manufacturers of DRESSMAN machine SIEMENS it can save your precious time and definitely there is no doubt it will also act like as a super hero to get rid of you from one of the most boring activity and you can utilize this time in some other professional activities or in entertaining yourself. It is fully automated and don’t need anybody’s interfere while ironing. 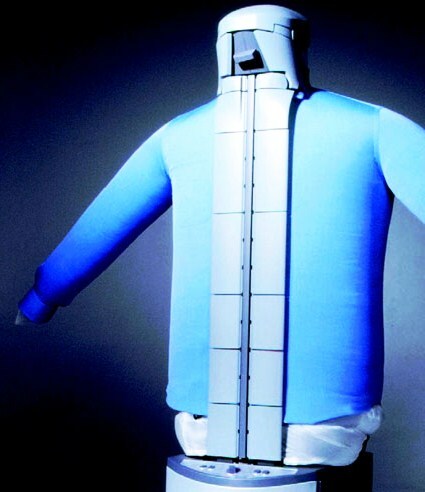 What you just need to start it is to just need to pull the required shirt over the dummy and just set the right program according to cloth quality like hot, warm, etc and just press start button. Now come back to your seat and watch, the shirt will start bulges because of emission of hot airs from dummy. And there are almost 1 dozen programs are built in for each kind of dress. Dressman can iron women braziers to full sleeve dresses of all sizes either of any kind of material like soft cloth like soft silk, cotton, stretchable or non-stretchable material, etc. In its other features, this machine is also eco friendly because of no emission of harmful gases and per shirt it only cost $0.1. So, you can start your own business from it. And the other benefit is that because of its low working temperature and pressure the color and brightness of shirt will not get affected and also will not weak buttons, respectively. In weight it is only 28 Kg. O I love this, What about the pent ?